“Kankrej breed cows have been neuclus of my family since its existence for more than a century. My forefathers have been engaged in rearing and breeding of this native Indian breed cow and now I am committed to carry on our legacy. We take care of our cattle just like our family members. 24/7 they are allowed to roam around freely without any restrictions. As we do not tie the animals they are friendly, have better reproduction system and milk produced is best in quality and quantity,” asserts Mr. Sanjay Desai, passion driven dairy farmer. 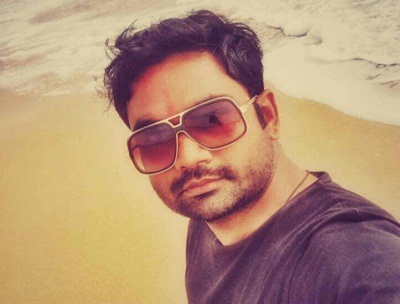 He is based at Ahmedabad, Gujarat. There are more than 300 cattle (mix of cows, bulls and calves) in his farm. “‘There are many myths encircling the credibility of indigenous cows of India. These are all false accusation and a genuine dairy farmer must not believe in it. There are more than five and less than 10 native breeds of India that give best quality milk ‘A2 Milk’. We are committed to Kankrej breed. We do not sell its milk or milk products but calves are sold to other dairy farmers to popularize the breed,” adds Mr. Desai. The cattle are fed with best quality fodder grown without any harmful chemical pesticides and fertilizers. “I have more than 25 farmers in my network who are taking care of my Kankrej herd. They are strictly instructed to feed cows and bulls with the fodder grown only naturally, primarily cow based farming inputs,” he insists. A good mix of green and dry forage is given to the herd. The fodder elements changes as per the season. In summer, green forage (lachka as called in Gujarati) is fed in the morning while dry forage in the evening. “We also give sorghum forage (jowar bhusa) in the morning hours. 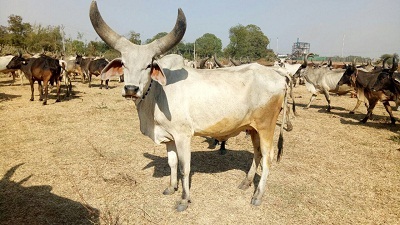 During monsoon only dry forage and silage (maize, sorghum and pearl millet) is given because the green forage mostly has some insects stuck to it which is unhealthy for the cattle. In winters we give groundnut husk and green maize,” Mr. Desai elaborates. More or less the fodder given is same for cows and bulls however there are some changes. “We give ghee to the bulls during summer. It lowers the internal body temperature and relaxes the bulls. Generally groundnut husk is not given to the bulls instead it is apt for cows because being high in fiber content it augments the reproduction ability,” he shares. Pregnant cows are never given any special diet because, “We do not want the cow to put on the weight. Heavier the calf more difficult becomes delivery. After the delivery we take good care of cows with change in diet. Calf is fed only its mother’s milk for first two months and later slowly it is introduced to the top feed,” explains Mr. Desai. Post delivery the cow is fed with boiled bajra ( pearl millet) along with jaggery water. Ghee (clarified butter) is added on top of it. “All three mixed together is given to the cow. It cleanses its internal body system and offers its strength to revive after delivery exhaustion,” he adds. He also highlights on two important steps before milking, “We clean the teats of the udder with luke warm water and then first let the calf have the milk. Calf drinks the milk till it wants and after it leaves then milking is done. The advantage is that after the calf drinks milk the teat becomes smooth and milking is done easily. It doesn’t hurt or trouble the cow at all.” Usually Kankrej cows start yielding milk from the age of 2.5- 3 years and continue till 19-20 years. Later to which it stops lactating. A special open space is designated for old cows and bulls (dry) where they are allowed to rest and be on its own. “They are given fibrous rich fodder, clean water and enough space to freely roam around. We deliberately separate them because the young cows troubles and dash into them,” highlights Mr. Desai. Kankrej cows and bulls do not like water therefore these are rubbed with coconut husk thoroughly. “It relaxes their body and also keeps it clean. Calves are well taken care by its’ Mother,” he states. The cow shed is never kept damp as it attracts many flies and mosquitoes. 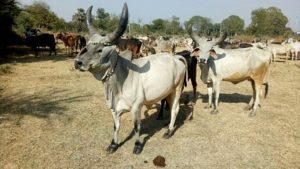 “We have fine nets in the closed enclosures and we burn cow dung cakes along with neem leaves every day in the evening. The smoke disinfects the entire cow shed.” There is no vaccination done of the herd raised within the farm however those calves purchased from other breeders occasionally vaccination is done on need basis. 15 months and above calves are sold at the farm. “We sell our pure breed calves only to trusted buyers who ensure to take care of our Kankrej breed very well. The price totally depends on its parental characteristics but by and large female calves are sold at Rs. 23 thousand and above while the male calves are sold at Rs. 10 thousand and above. The price varies largely,” he highlights.